Many Western countries such as the USA, UK, France and Germany, all considered friends of Bahrain, have strongly criticised the Kingdom’s recent security measures. The statements issued by these governments reflect an increasing concern that these measures could lead to the failure of the reform project and cause long-lasting instability. There was also concern that these measures could aggravate tensions in the region in a way that would serve the interests of the enemies of the West and its allies. On the other hand, some Bahraini journalists regarded these statements as interference in Bahrain’s internal affairs and added that they are biased towards a specific social group. Some also claimed that the USA aims to radically change the Kingdom’s political system. The general fear of the West’s position parallels some regional views which claim that Washington is willing to sacrifice its friends, such as Egypt, on the pretext of defending human rights and promoting democracy. 1. Countries in the West generally support the current regime in Bahrain and are keen for its stability. They are also in favour of establishing a constitutional monarchy, which allows a reasonable amount of freedom, promotes democracy and respects human rights. The West is not ready to compromise Bahrain’s security at the expense of regional conflicts. 2. The West also wishes to see Bahrain as a country that is heading towards democracy (which it indeed was before the recent painful events). Democracy is a product of humanity and is the best available system, bearing in mind Bahrain’s gradual transition towards it, which takes into consideration the aspirations and the makeup of Bahraini society. 3. The West also does not want to see grave violations to human rights in Bahrain, because any violation will not only affect Bahrain but the reputation of its allies as well. Many Western capitals have come under the pressure of international human rights organizations and Arab public opinion especially in light of the Arab Spring. There has also been an increase in political and media pressure, and from local MPs, which demand that Western Governments take a clear and/or extreme position regarding human rights violations in the country. In summary, Western countries require a reasonable amount of human rights and a control on the violations in any ally country, including Bahrain. 4. The West has a different vision regarding the stability of political systems, especially friendly ones. They believe that the absence of democracy and human rights will eventually lead to instability and without democracy it is difficult to justify their friendly relations with some countries. They also believe that adopting extreme measures will result in disorder and the interference of foreign regional powers. Hence, responding to the legitimate aspirations of the people and respecting human rights is what ultimately guarantees political stability in Bahrain in the long term. 5. It is noticeable that the Western countries’ statements adopt harsh language and attempt to apply political pressure on Bahrain, which raises the following question: why put pressure on Bahrain and not on other neighbouring counties that have not even started reforms yet and live in a state of political oppression and lacks public participation in politics? The West seems to believe that a setback in democratization is much worse than an authoritarian state. Moreover, the West also seems to put pressure on their allies as well as their enemies if there is public political movement, regardless of how authoritarian a State is. 6. The strong criticisms of Bahrain focus on human rights issues which have become an important part of international politics and an influential aspect in relations between States. Relations between Western countries, including their allies, are determined by their adherence to their citizens’ rights according to international conventions. From this analysis, we can now read the political positions of Western countries and the statements of their foreign ministers and parliaments. Their reactions do not represent animosity towards Bahrain nor are they a call for political instability because in short, this is not in the interest of the West itself. The British Foreign Secretary, 21/4/2011: “I remain concerned at events in Bahrain. Although the immediate situation appears calmer, there continue to be many credible reports of human rights abuses. The arrests of opposition figures, the reports of deaths in custody, allegations of torture and the denial of medical treatment, are extremely troubling. I call on the Government to investigate them fully and transparently. I urge the Bahraini authorities to act in accordance with the law and to meet international standards for the treatment of detainees. I am also concerned about the Government’s move to investigate prominent licensed, political opposition parties – which may lead to their suspension, and by reports that human rights activists have been arrested. The civil rights of peaceful opposition figures and the rights of freedoms of expression and assembly must be respected. I urge the Government of Bahrain to meet all its human rights obligations and uphold political freedoms, equal access to justice and the rule of law. Events across the Middle East have shown that governments need to respond with reform and not repression if they are to enhance the long-term stability and prosperity of their countries. I encourage the Bahraini Government and leaders of both communities to show real leadership in promoting tolerance and to demonstrate a shared commitment to the future of Bahrain. Jacob Sylvain, US Department of State, 29/4/2011: “ we are concerned about the hastiness of the trial and the sentences that were passed. It is important that trials are conducted legitimately and with transparency and credibility. It is investable that all parties will move towards a comprehensive political dialogue. This is the message we sent to the highest authority in the Bahraini Government”. Bernard Valero, 29/4/2011:” we call on the Bahraini authorities to not carry out the death sentence. Calm is restored now and it is time for a meaningful dialogue and reconciliation between all concerned parties. This is the only permanent solution for the political crises in Bahrain”. 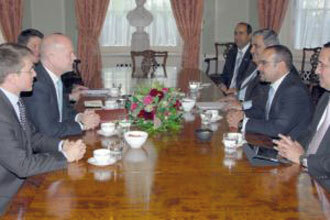 The British Foreign Office spokesperson, 30/4/2011: “The UK is concerned by the death sentences given to four Bahrainis. We support Bahrain’s right to bring to justice those responsible for the death of two policemen. But it is our longstanding policy to oppose the death penalty in all circumstances. It undermines human dignity, there is no conclusive evidence of its deterrent value, and any miscarriage of justice leading to its imposition is irreversible and irreparable. The High Representative of the Union for Foreign Affairs, Catherine Ashton, 3/5/2011: the death sentences will only increase tension in Bahrain and will become an obstacle to national reconciliation. Reconciliation requires engaging in dialogue without preconditions or delays. Also, it requires the implementation of real reform which is the only possible solution in confronting challenges. In accordance with international human rights conventions that Bahrain has signed up to, every person has the right to a fair trial including the right of effective appeal. The FDFA, 6/5/2011: “the FDFA calls on the authorities in Bahrain to commute the death sentences....Switzerland has already expressed its concern over the tense political situation in Bahrain in a number of bilateral demarches and will continue to call on the Bahraini authorities actively to continue their efforts to engage in a national dialogue”. British Foreign Office spokesperson, 13/5/2011: “The UK Government remains deeply concerned by reports of human rights abuses in Bahrain, particularly the widespread arrest of political activists and a large number of doctors and nurses. It is essential that medical personnel can treat their patients free from political interference. Those accused should have access to legal counsel and be tried before independent and impartial courts. We continue to urge the Government of Bahrain to meet all its human rights obligations and uphold political freedoms, equal access to justice and the rule of law. Those who have been detained should now have full access to the due process of law. The Government of Bahrain should also take swift, concrete steps to carry out the investigations into alleged abuses by Bahraini security forces to which it has already committed. US Department of State, 17/5/2011: Deputy Secretary Steinberg affirmed the long-standing commitment of the U.S. to a strong partnership with both the people and the Government of Bahrain and stressed the importance of full respect for universal human rights. He urged all parties to pursue a path of reconciliation and comprehensive political dialogue. US Department of State, 19/5/2011: State Department has a long history of supporting reform efforts in Bahrain, through direct diplomatic engagement and projects of the Middle East Partnership Initiative (MEPI). During the past eight years, MEPI has worked strategically with Bahraini partners on a reform agenda focused on political pluralism, women’s rights, youth empowerment, labor, civil society strengthening and legal and judicial reform. Engagement around these issues has included opportunities for dialogue and collaboration between government and non-government stakeholders. MEPI supports the growth and aspirations of Bahrain’s peaceful civil society. Recent programming with civil society partners has focused on raising awareness of women’s rights at the community level; developing documentary films and public service announcements on domestic violence; conducting trainings on disability rights, strengthening civil society, governance and transparency, human rights and media monitoring, and training for female candidates.. Since September 2009, the American Bar Association, with MEPI funding, has been working with the Ministry of Justice and local bar associations to increase judicial capacity, improve legislative drafting, and promote professionalism among Ministry officials. The U.S. Embassy has emphasized youth programs, including enhanced collaboration with academic institutions, and exchange and scholarship programs focused on potential young Bahrainis. Secretary Clinton delivered a keynote address at the Manama Dialogue in Bahrain on December 3, 2010, in which she highlighted “human security” as one of four main principles critical to maintaining Gulf security. She defined human security as including participatory governance, freedom of expression, free access to education and employment, and women’s empowerment. While in Manama, the Secretary also held a town hall meeting to directly engage with civil society and youth. DRL Deputy Assistant Secretary Kathy Fitzpatrick visited Bahrain on January 11 to engage the Government of Bahrain and advocate for reforms, including on its incarceration policies, commitment to transparent judicial proceedings, and civil society development. Assistant Secretary Feltman has visited Bahrain five times since demonstrations began in February to address unrest and political reform. Deputy Secretary Steinberg visited Bahrain May 17 and affirmed the long-standing commitment of the United States to a strong partnership with both the people and government of Bahrain and stressed the importance of full respect for universal human rights. He urged all parties to pursue a path of reconciliation and comprehensive political dialogue. President Obama, 22/5/2011: “we have insisted publically and privately that mass arrests and brute force are at odds with the universal rights of Bahrain’s citizens, and will not make legitimate calls for reform go away. Council of the European Union, 23/5/2011: “The European Union strongly encourages Bahrain to ensure full respect for human rights and fundamental freedoms, including freedom of expression, and accountability regarding allegations of human rights violations including reported cases of torture and ill-treatment. The EU also encourages fair and transparent administration of justice including in cases involving charges against medical professionals. Access for independent observers to ongoing legal proceedings should be allowed. The EU welcomes the decree issued by King Hamad of Bahrain, according to which the state of emergency will be lifted on 1 June. We look forward to the practical actions which will support this move. French Ministry of Foreign Affairs spokesperson, 24/5/2011: “France, like its European partners, is resolutely opposed to the death penalty everywhere and under all circumstances. I remind you that we had, April 24, denounced the death sentence at trial of several people following the events of recent weeks have shocked and saddened Bahrain. We call on the Bahraini authorities not to apply this sentence upheld on appeal by a military court against two Bahraini nationals. It is time to seek ways of a sincere dialogue between the parties and reconciliation, the only lasting solution to the political crisis in Bahrain. Respect for fundamental freedoms and the fair administration of justice and transparency are essential to carry out such a process”. Ban Ki-moon 3/6/2011, welcomed the King’s call for national dialogue and called on all parties to participate in it in order to reach general reconciliation. This is in order to benefit the Bahraini society and guarantee stability, security and progress. US Secretary of State after meeting with the Crown Prince, 7/6/2011: “it is very significant to have these discussions, to hear directly from the Crown Prince about the plans that Bahrain is pursuing with respect to dealing with the issues that it currently is considering at home, and to create the conditions for political and economic reform.